Superb quality HiFi system, creating a rich and luxurious musical space. Early Sunday afternoon. A quiet time at home. through the room from my favourite piano-finished speakers. HiFi sound, and the texture of a piano—what a luxurious moment. The MCR-N870 is equipped with the latest Bluetooth technology, making wireless operation more convenient than ever. You can stream music from the MCR-N870 to Bluetooth headphones for private listening or to Bluetooth speakers. In order to vividly portray absolutely everything in various high-resolution sources—from the most delicate performance nuances to the highest energy-filled dynamic musical passages—Yamaha has built into this amplifier a digital power amp that outputs a maximum 70 watts/channel and features powerful drivability. Natural PWM type digital modulation with an extremely simple circuit configuration provides both natural, uncoloured sound quality as well as high efficiency. And the low-pass filter of the latter part of the power amp, which significantly influences the sound quality, is a large coil made of low-loss, low-distortion OFC (oxygen-free copper) wire material. This simultaneously maintains the purity of high-resolution sound sources, while enhancing the power of the bass and ensuring warmth in the mid- and high-frequency sounds—all to deliver the best quality sound reproduction, rich in musicality. The component also features a Pure Direct Switch, which bypasses the tone/balance controls and back buffer amp to improve the purity of sound. Built into the unit is an exceptionally high-grade USB DAC which can reproduce high-resolution sound sources with all their original quality. It is compatible with native playback of the DSD 5.6MHz (DSD128) format or 384kHz/32-bit playback which records music information with extraordinary detail by sampling up to a massive 5,644,800 times per second. 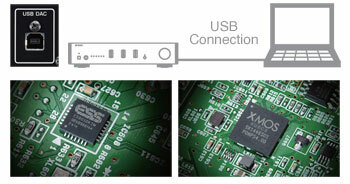 The D/A converter is the 32-bit/2-channel specification, high-performance SABRE 32 (ES9010K2M) from the U.S. company, ESS Technology, and its USB device controller IC is the latest product from XMOS, the semiconductor firm. By restricting shutter noise through asynchronous transference, this delivers pure reproduction and optimum sonic quality. Another major benefit of the USB DAC function allows it to also be used as a high quality head phone amp for computer audio. Its internal high performance D/A converter draws out all of the quality of high-resolution sound sources to give you the purest, most intimate enjoyment of high-quality sound. The sound, the atmosphere— both brilliantly fascinating. The cabinet is distinguished with a black mirror plane piano finish, which radiates a beautifully deep, lustrous shine. This draws on manufacturing methods for musical instruments: taking advantage of the sound and of the original acoustic resonance of the materials, and crafting a finish by employing a coating process identical to that used on a Yamaha grand piano. The resulting natural sound allows you to actually feel the touch, sensation and colour tone of each musical instrument. This is where an extravagantly elegant musical time begins. 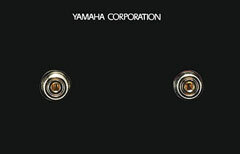 The uncompromising work done in producing a Yamaha piano finish spares no effort or time. For example, each process in the overall coating procedure, the under-coating and top-coating, is further divided into three or four repeated coatings, while controlling the membrane thickness at the micro-order—with the total process actually having fourteen coatings. Naturally, the drying periods between coatings are also strictly controlled, and grinding and polishing are repeatedly done with care before and after each coating step. And more than half of the process is completed by hand, using the skills of experienced workers. The rich, lustrous appearance with such profound depth is the crystallisation of craftsmanship nurtured by the art of piano-making. The diaphragm of the 13cm (5-1/4”) woofer is made of quality aluminium that is over 99% pure. Its light weight and high rigidity obtain a superior response for rich and high-density delineation of the texture, atmosphere and tone colour of each musical instrument. Another major feature is the capacity for delineating details in the natural sound image, even including depth—such as the positional relationship of each musical instrument in a jazz piano trio. The 3cm (1-1/4”) soft dome tweeter, made by coating the diaphragm and applying unique molding technology, delivers both exceptionally high-range reproduction capability and a rich breadth of sound from high-resolution sound sources. It features a highly rigid cabinet with full three-way mitered-joint construction that connects all angled parts that are crucial to cabinet strength based on the wedge principal. Yamaha’s traditional know-how nurtured by its long history in musical instrument manufacturing skillfully controls reverberations of the sound indispensable for music, while achieving high rigidity that prevents unwanted resonances. And following the meticulous polishing carried out to make invisible the joints between surfaces, the unit is given a beautiful piano finish. Sections of the network circuit and the internal wiring are composed only of the highest quality parts and materials, carefully selected by meticulous listening tests. Moreover, large speaker terminals compatible with banana plugs have been gold plated to suppress transmission loss and change over time.